Now here comes the fun part. Personally I believe that the artistic skills of a photographer cannot be taught. Those are skills that you have to hone. You can get twenty different people to take a picture of one thing and you will get twenty different photographs. What I can teach is the basics. The art is called composition. It is the balance of all things in a photograph. The elements, the way the light interacts with those elements, the way those elements are arranged, are all part of a photograph. That is just a small part of it. The art of composition has its roots waaay back to the Renaissance. It is interesting to note that the guidelines for creating a photograph were already established centuries before the first camera was invented. There are three different ways to layout the elements in a photograph. One, is to fill the frame. This will provide a clear description of what the photograph is about. Two, is the "rule of thirds". Three is the "golden mean". Both of these provide a means to capture the background in the photo as well a creating a compelling photograph that guides the eye of the viewer. This is fairly basic. 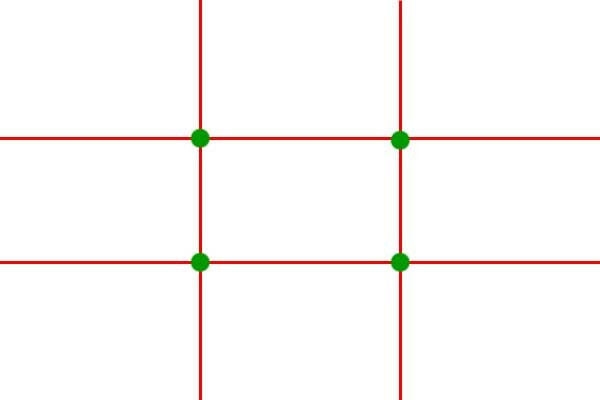 Simply divide the frame into three parts, then place the subject (Green spots) on the two dividers (Red lines). See the diagram below. This is also basic but a bit more obscure. Mentally draw a line (Red line) from corner to corner of the frame. Then draw a line from the opposite corners to the line. 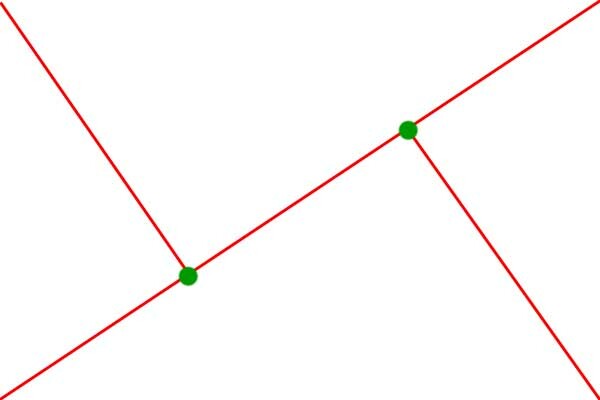 The subject should lie at the intersection of these two lines. (Green spots) The reason for the obscurity of the technique is that it was developed in ancient Greece. Hence we have had more time to forget about it. The golden mean and the rule of thirds are so similar, that I'll focus upon the rule of thirds. I've done this for the sake of clarity. These basic rules are the basic building blocks of composition. The aim here is to create a visually compelling photograph, something that captures the attention of the viewer. The rule of thirds and the golden mean aim to create a photograph that leads the eye of the viewer around and tells a story behind the photograph. The trick of the photographer is to arrange those elements to allow the photograph to tell the story as the photographer would like it to be told. It is true that a photograph is worth a thousand words and photographers are the ones that write them. Self explanatory. Find something that captures you eye. Try to avoid distracting objects or shadows. I think Robert Capa, a WWII photojournalist said it best, when he said, "If you're pictures are not good enough, they you're probably not close enough." Get the subject into the frame so there is no doubt what the photo is all about. Try to avoid anything that would distract people from your main subject. Focus on the subject. Then before you press the shutter, check the edges of the frame for anything that would distract the viewer. Have fun with your subject. Look for repetition or patterns. Keep your eye out for diagonals which are always interesting. Scan for contrasting colors and shapes. Use the aperture to create depth. Make objects in front and behind your subject a little out of focus. This will provide the effect that isolates the subject from the background. Focuses attention on the subject. Basically light tones advance while dark tones retreat. Most people look at the lighter portions of a photograph first. Vertical and horizontal are bad, diagonal is good. Psychologists say that instincts honed back our caveman days are responsible for that. Diagonal images are visually more interesting that vertical and horizontal. This is the use of elements in the foreground to frame the object in focus. This is the basics of composition. I'll try to devote some more time to describing each one of the compositional elements in more detail. Vertical lines emphasise power, strength, and height. Horizontal lines express stability and width. Diagonal lines express dynamic energy. Next Lesson: Composition - Rule of Thirds.